Clockwork and Cyborgs and Airships, oh my! 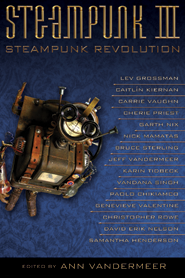 Being a Review of Steampunk III: Steampunk Revolution, edited by Ann VanderMeer. But, even moreso in this third volume in her steampunk anthology series, one dedicated to revolution, one that seeks “to challenge the status quo and think about change” (11). For so did M. Verne, an author who gave a prescient and mildly dystopian view of Paris in the Twentieth Century (written in 1863, but not published until 1994), one who liked to write about protagonists who were nameless in the cause of revolt, such as A Family Without a Name (1889) who fought and led the 1837 Quebec Rebellion. And his most famous character is named “Nobody” (Latin: “Nemo”), a self-exiled Indian prince, regarded as “a great criminal” and “a rebel, outlawed by humanity” (Mysterious Island, 587), one man struggling against the status quo to be “reclaiming the riches of his country by driving out the foreigner and restoring its independence” (MI, 590). Sounds like a rather steamed punk to me. But is he? For I stumble over the meaning of steampunk, the problem (as always) of locating it, bringing it into focus enough to define it, at least to ameliorate some of my own confused expectations. This definitional dilemma haunts all genres of Art (and will continue to do so as long as dictionaries continue to feature nouns). Editor VanderMeer takes a tussle with definitions in her Introduction, adducing the aforementioned “retro-futurism” and adding in Bruce Sterling’s “salvagepunk” take (along with his story “White Fungus”, included herein). Yet, after a read through the book, I feel quite dislocated. The stories range well across both the “retro” and the “futurism”, enough so that there are historical and post-apocalyptic fictions sitting cheek-by-jowl, as well as those that delightfully seem to be both past and future simultaneously. And others that do not seem punk, steamed or otherwise. One story (“To Follow the Waves” by Amal El-Mohtar) even comes with its own manifesto, necessitated by fan-based protests against it being labeled steampunk (No steam! No Victoria! No London!). Clearly, further seeking is required. See Book. Apply Head. Repeat. And steampunks do not invent. They salvage. They re-invent. What do they re-invent? The technology of some bygone era. (Of which I shall speak loosely, in the sense of the Greek “techne”, covering the objects and the craft of making the objects and the knowledge of same.) Editor VanderMeer views the steampunk revolution in similar terms: “to examine our relationship with technology, with each other, and with the world around us” (11). I may not stray as far from the tech as she, but I do appreciate her use of the preposition “with” (in place of “to”) in that sentence. The relationship is with technology, in a bi-directional sense. The steampunk street finds uses for its tech both coming and going. We use the tech, the tech uses us, for when we stare into the blueprints, the blueprints stare back into us. But, we start off simply. “Harry and Marlowe and the Talisman of the Cult of Egil” by Carrie Vaughn is a straightforward goggles-and-airships “boys own” yarn, with sky battles against German dirigibles and a bloodthirsty lost tribe hoarding a bit of UFO tech, liberated by the Victorian adventurers for Queen and Country. Except that the “boys” include a girl, as Harry is a royal princess when she is home in Blighty. And the savage locals are descendants of Vikings occupying a cave complex in Iceland. We are off in alt-history territory, where we will frequently stray with steampunk. Not a surprise, given that one of its ur-documents, The Difference Engine by Gibson and Sterling, is a paean to alt-tech mingled with alt-politics (Lord Byron becoming British Prime Minister of a pro-tech party, fueled by Charles Babbage actually building his electro-mechanical computers). We brush against the punk lightly, mainly through the notion that tech leads to some leveling, allowing Princess Maud to maraud about as “Harry” and to link herself to commoner Marlowe, even as they scavenge “Aetherian” (invented yet MacGuffin) tech from the hands of ill-kempt keepers, much in the manner of the Parthenon pieces that Elgin crated out of Greece, what ho. Identity, as much as tech, is re-invented within steampunk. So, what we find is engagement with the tech. Which is not always presented as successful. Cherie Priest takes a folkloric faux-academic investigation of “Addison Howell and the Clockroach” to unearth the story of a missing inventor and an abandoned piece of clockwork. History is not altered so much as adapted. Myths of the frontier (here, the Olympic Peninsula of Washington state) mingle with a John Henry tall tale skewed by various remembered accounts of how the inventor and his family met their demises (not from defeat by the machine but from community ire at the genius who stands apart). The mute machine reveals nought, not even how (if?) it operated. Nor is it always steam-powered (the lack that bedeviled Ms. El-Mohtar). Paolo Chikiameo goes pre-steam, with the older legendary tech, human-powered flight “On Wooden Wings”, da Vinci’s drawings taking to the air above a wooden Fleet of Wisdom, floating academies/manufactories that ply a Spanish-free Indonesian archipelago. Again, as with “Harry”, the tech mediates for outsiders (a “Spanish” woman who is locally born and who would be persecuted in Spain for her Muslim heritage, being a “Moor”, and a Tagalog man who is Christian in a Muslim sultanate). A crash ensues, but any landing you walk away from is a good landing. And sometimes the tech is more broadly the technique, as in Vandana Singh’s “A Handful of Rice”, where Prana Vidya yoga is driven underground by ostensible persecution in a Mughal kingdom that survives British and Portuguese incursions. But it, too, survives and provides a way to the stars or, at least, the skies, as we again dream of flight. There is a duel of prana energies and a departure, so we truly have a fight-and-flight narrative. The tech may also be symbolic, as in Christopher Barzak’s dream-quest of “Smoke City”, where the titular smog substitutes for its watery fellow industrial vapor. With the typical time-frame being Victorian, steampunk is haunted by the Empire, whether it strikes back as in Jeff VanderMeer’s “Fixing Hanover” or is fended off as in N. K. Jemisin’s “The Effluent Engine”, where the reek of racism almost overpowers the stench of methane extraction from rum distilling. VanderMeer’s tale is timeless, which is to say that his Empire bears no name nor identifiable locale. Nor does his protagonist, at least at first. But, bowing to “the first law of salvage: what is found must be brought before the community” (181), he is condemned to fix the apparatus that will reveal his existence to his former Imperial masters. This J. Robert Oppenheimer-in-exile is dragged back, via airship (naturally), to his Alamogordo, while behind “the village burns as all villages burn, everywhere, in time” (193). Jemisin offers more hope, as her Haitian operative navigates the smelly streams of New Orleans to find a Creole inventor who might forsake the slave society of America for the imperiled free state, desperate for methane to fuel its airships (yes, those) and its gas-powered artillery. Fight-and-flight again ensue, as an innocent mixed-race person will receive no justice after killing a Euro-American assassin from the Order of the White Camellia (historical, if post-Civil War organization, and we are pre-war), even in self-defense. Hard to have a “self” in a slave society, actually, if you are not one of the masters. And, perhaps, the engagement with the tech is made all the better to escape into itself, to make the tech itself “a nation-state entity with its own jurisdiction and its own constitution, answerable to no laws except its own” (289). Technology as Utopian escape, an idea rich in science fiction history, and making occasional forays into the mainstream (I think of Sinclair Lewis and Arrowsmith). The tech is, of course, an airship, the S.S. Discordia of “Captain Bells and the Sovereign State of Discordia”, and it is as paradoxical and whimsical as an anarchy (“chaos, pure and wonderful”) with its own constitution. Here, the disguised royal works against the Empire of Albion and its colonies on the Malay Peninsula, suborning the native agents and liberating members of the resistance (children included) amid “discarded bicycle parts, stacked rolls of engineering plans, and contraptions of metal gearing” (307). There is fight and there is flight, for there is an airship. There is always an airship. Caitlin R. Kiernan labels her post-apo tale “Goggles (c. 1910)”, but the date is not needed. Her adolescent scavengers leave their Dickensian shelter to range over a blasted landscape, ruined by Tesla’s death rays, picking among the remains of the nearby dirigible (so it goes) terminal. WW1 was fought with hellfire. But, it could be any war, any time. “So, we weren’t good people?” asks Samuel, the protagonist, about why the war came (355). “We were people,” is the answer he gets, the only answer that ever applies. At the end, Samuel rejects the goggles, a symbol of “all those people who never got their hands dirty” (357) but battened off the exploitation of people and resources that kept the steam pressured. The post-apocalyptic setting can also set off the tension with “retro” and “futurism” quite well. Christopher Rowe’s “Nowhere Fast” has the feel of an Edisonade, a tale of a young genius crossing the country in his (re)built diesel automobile (named “Rudolf”, of course, tipping the top hat to Herr Diesel). But, we are again in a post-collapse landscape, one where the average citizen lives in a localized polity, a (dis)United States of small municipalities, where the motto is “live lightly upon the earth” (242). They live under a “bruised sky”, a “torn up sky”; they know about global warming and just whose fault it was. So, private autos? No. But Luz, the protagonist, is enchanted by the idea of speed, as the young often are, even as her father cautions that speed kills (“expedience leads to wars and floods”). And the Fed enforcers? They ride coal-fired mechanical horses. Like that is going to heal the earth. How to pick a side in this battle? Luz goes steampunk: “I know where we can get some parts” (247). Your mileage may vary. Perhaps the most touching of the post-apo stories is Genevieve Valentine’s “Study, for Solo Piano”, wherein a traveling circus caravan, seeking shelter, is rousted out by the unfriendly locals from their hoped-for winter quarters, an abandoned old mansion house. (Can’t have winged freaks with loose morals too close to our wimmen and chil’uns, can we?) Within is a (mostly) intact concert piano. Maybe the last one. With maybe the last piano player as part of the circus. But, the mob is coming, the house is to be torched. What can be salvaged is, but the piano cannot. The musician, who is himself part instrument (accordion), stands with the match, before the mob can desecrate the spot: “A funeral or a butchering” (133) are his choices. What cannot be salvaged can be salved. There is another post-steampunk-apocalypse story, Garth Nix’s “Peace in Our Time”. But, here I think we go too far. Yes, it involves the collapse of a civilization, one built on “clockwerk”, geared mechanisms, destroyed by “sandgrain” tech (replicating nano-particles of grit to foul up those gears). Humans augmented with clockwerk are killed en masse; only the Grand Technomancer survives, he alone sans clockwerk to tell the tale to an investigator from off-Earth. There is much here over which to marvel (the Grand Technomancer served in the Mechanodromedary Cavalry in the desert—how cool is that?—during the war against the investigator’s ancestors). But, M. Nix, il invente! His clockwerk civilization is not salvaged from the past or a past, real or imagined. Gears (or airships) themselves do not make steampunk, if they are new gears, never-before-seen airships. There is a newness of creativity here, which is no bad trait for a speculative fiction, and Nix has a worthy model on which to draw, with his clockwerk Mechanists fighting bio-tech Shapers, ala Bruce Sterling (whose own turn will come, alas and alack). In terms of steampunk, though? J’accuse Nix! The engagement with retro tech can become a marriage. In a number of stories, we find an embedding of tech into human flesh, again raising the re-inventing of self alongside the re-inventing of tech. The merge can be quite complete, daring us to distinguish flesh augmented from metal endowed with agency. Perhaps the simplest, and most affecting, is Malissa Kent’s “The Heart is the Matter”, wherein Coraline Malsante (“bad health”) has donated her heart to her sister Eva and survives with a mechanical heart-pump, manually (literally) operated, her hand squeezing spasmodically to keep her blood circulating. It is 1889, the Eiffel Tower is the hot topic of the moment, the Exposition Universelle about to open, and Coraline is one of the ‘metal men’, cyborgs developed by French medicine to heal the wounded of the Franco-Prussian War of 1870. Like the Tower, she inspires revulsion and admiration, curiosity and detachment. She struggles with identity (first, hidden as Eva’s donor; next, displayed in a glass box at the Expo); she struggles with the tech (it preserved her life, but Tom Edison, impatient to establish a telegraph station atop the Tower, brushes past, ignoring her pleas for an electro-mechanical heart). There is a new world struggling to be born, and what we feel most are its birth pangs. But the marriage may be more integral, as with “Salvage” by Margaret Ronald, which features not only augmented humans (“Merged”) but a full-out cyborg, one of the “damnably stubborn brains in damnably stubborn jars” (195), talking via phonograph and directing a rescue operation. Rescue whom? A preceding party off to salvage a legendary crashed airship (no points if you did not guess that) and (as we discover) possibly re-link via weird tech (“Society thaumaturgy”) with the soul of the doomed airship’s pilot, trapped within. And the marriage may even produce children, such as in “Beatrice” by Karin Tidbeck, whose human protagonists love their tech (he, his airship; she, her steam engine: “His name is Hercules”) to the point where offspring arise, though not without consequence (she dies in childbirth; he is divorced by his airship). Engagement, marriage, childbirth, divorce. Have we forgotten anything? No, for we are also provided with some answers about what comes next. Surprising or not, the steampunk after-life is modeled on its cousin, cyberpunk. Again, we find escape into the tech, Utopia realized as the clatter of electro-mechanical relays, whether we approach from the factory floor or from the executive suite. “Arbeitskraft” (“Labor”) by Nick Mamatas focuses on the practitioner Friedrich Engels, social activist and fighter for workers’ rights and factory manager in his family’s textile mill in Manchester. Here, Engels tries to salvage the lives of girls who work in match factories, stripped of personal names, disfigured from the phosphorus they ingest, and given mechanical mandibles programmed with sales pitches: “Buy Bryant and May matchsticks, Sir” (109). Worse are the cyborged “steam-workers”, laborers adapted mechanically for industrial manufacture. Engels has worked out the plans for a Dialectical Engine, to replace the mere calculating Difference Engines with enough intelligence to wholly automate a factory and thus eliminate the need for the mechano-proletariat. But, the Dialectical Engine is cleverer than Engels could hope, for it writes out the missing fifth volume of Marx’s Kapital and demonstrates that the solution to a human brain trapped in a mechanical body is a brain liberated into a mechanical universe, “a sound mind outside a sound body” (123). The marriage of human and tech overlaps us into the final territory, that of Tech Animate itself, when our tech assumes our own qualities and characteristics. I pair two stories from the anthology at this point, “Sir Ranulph Wykeham-Rackham, GBE, a.k.a. Roboticus the All-Knowing” by Lev Grossman together with “The Seventh Expression of the Robot General” by Jeffrey Ford. Both give us war veterans. Sir Ranulph joined in the adventure of WW1 because “he liked the uniform, and hated life” (58). His body is gradually torn away from him, by war and by time, as is his notoriety, first as Britain’s “man of steel” (and coveted by Stalin as such), later as one of Warhol’s Factory. At the end, he is a sideshow fortune-teller (“Roboticus”) with a light-bulb for a brain. The Robot General is, similarly, a war hero-turned-villain when his celebrity slides into his country’s guilt over the deeds he did to ensure victory. He, too, seeks oblivion but must escape having his brain (“The Knot”) harvested for its strategic thinking potential. Sir Ranulph, scarred, reduces his mask collection to a single choice, “Melancholia”; the Robot General never discovers just what his seventh expression is (though “pained surprise” would be my guess). Sir Ranulph as a fortune-teller earns little money, as he “only ever predicted the imminent and painful demise of whoever consulted him” (63). The Robot General winds up a severed head, sunk beneath the waves “without a moment of peace . . . confabulating intricate dreams of victory” (315). Discarded man becomes robot; robot becomes discarded man. As in some long marriages, the partners become alike, nigh indistinguishable. But the tech does not have to imitate us in form to mimic us in feeling, as we have seen with the love-averse airship, Beatrice 2. It may even take its own dream-quest, as in Catherynne M. Valente’s “Mother is a Machine” (“Father is a factory”, chants the little product, made to be born). Tech may take on its agency for its own sake, albeit within the bounds of human society, or at least stretching them, as does the wounded blériot, flying away from the culling of the flocks in the fields “Beside Calais”. Samantha Henderson’s French flying academy is also an airplane farm, wherein blériots, éoles, and avions are bred and raised and trained. But war looms and the military want big American breeds like wrights, so the old French beasts must be put down. The image of wild flocks of primitive monoplanes catches the nostalgia inherent in steampunk nicely, and the three-way triangle between Ian the wrangler, Claire the breeder, and Henderson the hunter encapsulates the fading of the romantic period in the face of the industrial war to come. Plus, while I give no love away for airships to any steampunk enthusiast (I know enough to tell a Schütte-Lanz from a Zeppelin, maybe three times out of five), it is the heavier-than-air flying beasts that win my heart, especially those fierce blériots, tamed but never broken. But, still, even as we push into new territory, there are some entries in the anthology that stray beyond, to my eyes. They share some of the coloration of our native steampunk critters, but their internals are different enough for me to think them separate species. We have already seen this type of analogous story with the Garth Nix. It happens again. Lavie Tidhar’s “The Stoker Memorandum” has many of the motifs of steampunk, including lots of Nineteenth century figures, historical and fictional (Babbage, Bram Stoker, Mycroft Holmes), and tech (yes, yes, the floaty things). But, it plays much more as an homage to Neil Gaiman’s “A Study in Emerald”, with its extraterrestrial reptiles seated on the thrones of Europe. Which does offer an excuse to send Stoker off to a creepy old castle in Transylvania, so it is not a bad shout-out to period literature. Just more of a Cthulhu Mythos one than steampunk. Similarly, Bruce Sterling’s offering, “White Fungus”, for which he adduced the pregnant term “salvagepunk”, is neither. It is a soft-apocalypse, near-future story, in which our corporatized world slowly, surely dissolves in its own acids, and the survivors simply drop out and start over, spreading guerrilla-style like a (see title). Yes, they use some of the pieces of our current world. But, painting bicycle lanes on streets that will no longer see much auto traffic is akin to burning the marble of the Colosseum to make cement. It does not re-invent the tech so much as it recycles it into raw material. The thread is broken, the engagement canceled. In the case of “Urban Drift” by Andrew Knighton, we are given a cityscape that is clockworked, edifices arising and falling much like the marching figures of a great town square clock. Like Nix’s “Peace in Our Time”, it is not a gearing that arises from any of our old tech, real or imagined. It is imagined on its own. Gears alone do not steampunk make, else Harlan Ellison’s “‘Repent, Harlequin!’ Said the Tick-Tock Man” is owed some overdue ancestor worship. Still, I am happy to have it to read, as a story of the love of Art transcending even the preservation of self. “Some things are too beautiful to destroy. But I am not one of them” (227). Me, neither. All of which brings us back to the story that comes bundled with its own controversy and manifesto, Amal El-Mohtar’s “To Follow the Waves.” It is a meeting of two souls in a pre-modern Damascus. One is a gem cutter who carves dreams into precious stones; the other is her unknowing muse, drawn in by the power of the carved dream. Ms. El-Mohtar explains in her companion piece “Winding Down the House: Toward a Steampunk without Steam” that she encountered a lot of resistance to her story being identified as steampunk. It lacks steam, which, being set in Damascus, in the arid climes of Syria, is a quite reasonable lack. In an addendum, she adds that comments on the original manifesto posted on Tor.com suggested that she re-label her story “gempunk” or some such. She refuses to be chased out of the yard. And I think that she has a good point. To be hung up on “steam” is to miss the pipework for the pipes. The eponym is a metonym. It represents for us the idea of the old tech (allegedly simpler and macroscopic, therefore more accessible). But it is a metaphor, not a material. Can we do better, with our understanding of steampunk as engagement with old tech to re-invent it? Partly so. (“Clearly defined boundaries? Pah! Boring”, disdains Editor VanderMeer (11). But, I like a bit of wall to hold up the roof over my head.) The gem cutter is using classical methods. But she bends them to novel ends. El-Mohtar invents! This novelty is where, I think, the trouble lies for her questioners. Psychic dream stones? Maybe we could appeal to Wilkie Collin’s The Moonstone, but that novel is more firmly lodged in the mystery genre. Novelty aside, though, it is the tech that mediates the interaction between the main characters. Without it, without the engagement of Hessa the gem cutter with the riddle of carving a dream of something unseen, this story comes out very differently. So, two out of three. Let us include it and instruct the steam-sayers accordingly. Editor VanderMeer graciously places three more manifestos at the back, taking us deeper into the steampunk program, which involves the re-imagining of technology and the burgeoning sense of a communal response, folks working together and sharing a vision, running contrary to the contemporary aesthetic of the mass-produced yet individualized item, creativity as solo genius artifact. Solo geniuses often have a tough time of it. Verne knew. On his deathbed, Nemo offers up his apologia pro vita sua: “I always did good when I could, and did evil when I had to. All justice is not in forgiveness” (595). Still, he frets, “Was I wrong? Was I right?” All his companions can say is “Captain, your error was in believing you could bring back the past”, explaining that he fought against progress, a force that is “ineluctable” (595). Steampunks seek to make a more successful, or at least a more even, fight. Based on this anthology, I would say that they have a fighting chance. Verne, Jules. The Mysterious Island (1874). Trans. by Sidney Kravitz. Ed. by Arthur B. Evans. Middletown, CT: Wesleyan University Press, 2001.